Jamie Oliver is one of the first chefs who really, really inspired me. The type of food that he cooks, the ingredients he uses, and his easy no-nonsense methods come together to produce artful, creative, and delicious dishes. I can vouch for the delicious part because I've tried a number of his recipes and I've yet to be disappointed. In fact, if the measure of a good recipe can be defined by how tattered, worn, and smattered with stains it is, then Jamie Oliver's Seared Scallops and Crispy Proscuitto with Roasted Tomatoes and Smashed White Beans is one killer recipe! Page 160 in his book The Naked Chef Takes Off has been used so many times that it practically falls open there without prompting! The flavors of this dish are fantastic: the salty, nutty, slightly spicy bean mash, the sweet roasted tomatoes with oregano, the crispy salty proscuitto, succulent scallops with zingy lemon dressing, and the cool peppery arugula leaves. In addition to the fantastic flavor experience, this dish offers a range of textures that make each bite unique and satisfying. This is a restaurant caliber meal that is really not very difficult to pull together. The only thing that requires attention is coordinating the several steps that need to be prepared simultaneously and then pulling them all together to be plated up. 1) Preheat oven to 475F. Season the tomatoes (salt/pepper) and sprinkle with oregano – drizzle with some olive oil and roast in the oven skin side down for about 10-15 minutes. Place the proscuitto slices beside the tomatoes and roast for another 10 minutes so that the tomatoes are juicy and the proscuitto crispy. 2) In a pan fry the garlic in olive oil with chillies and anchovies for a minute or so then add the drained beans and cook all together for a few minutes before adding a wineglass full of water. Bring this to a boil and then using a wide spoon to mash it into a coarse puree. Finish the flavor off with some peppery extra virgin olive oil – taste it and add salt/pepper if necessary. 3) Season the scallops (salt/pepper) and then sear them in a frying pan with a touch of olive oil for 2 minutes without touching them. Check to see if they've developed a golden, caramelized crust – if so then turn over and allow the other side to cook. Be careful not to overcook. 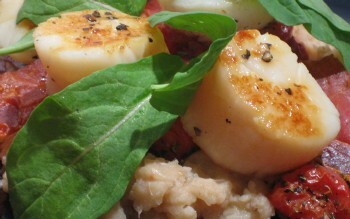 Remove the scallops to a bowl and drizzle with the lemon dressing (recipe below). 4) To plate this dish begin with the bean mash, then scatter the tomatoes, proscuitto, and scallops. Finish by adding the arugula. That sounds really appealing. Picture perfect. Woah–this looks incredible. I’m going to have to put this on my “to try” list. The dish looks great! I’m on something of a mission to learn to cook about anything outside instead of inside… by taking one or more ingredients and using the smoker to prepare them. I may try this that way, by doing the searing on the grill, finished with a short time in some pecan smoke. And maybe caramelize the tomatoes in the smoker! Good inspiration for something new; thanks! Jamie Oliver is one of my favorite celebrity chefs. (Only partly because of his accent ) I love his cooking style and how laid-back his recipes are, if that makes sense. Anyway, this sounds really good! This is easily one of my favorites! Mmmmmmm, the list of ingredients is a big hit! I love them all! You know, it is funny, I do not own one of Jamie Oliver’s cookbooks, and I am now intrigued! Thanks for posting this recipe. I made this from my parents last weekend and it was a big hit. We are lucky to have heirloom tomatos available and this recipe makes great use of them. I even took your suggestion and used the anchovies (even though I don’t care for them) and I agree that it gave more depth. My parents raved about the dinner and will add it to their * must cook * list for company. The only change I made was swapping basil for arugula and chopped it into ribbons to sprinkle over the top. I LOVE scallops! And in combination with prosciutto! I’ve been so busy that I haven’t been cooking much at home, but I’ll definitely try this as soon as I can.